This clear brandy, which is still aged in oak so I’m a bit confused how it manages to be clear, is definitely a departure from standard brandies. I could tell that from first smell, which was of peanut brittle and roses. Both scents were strong and such an odd contrast that I questioned my nose, but that’s what I smelled. When sipping, the brittle taste rushed to the foreground, but was quickly followed by a wall of rose. There were no other tastes I could discern. 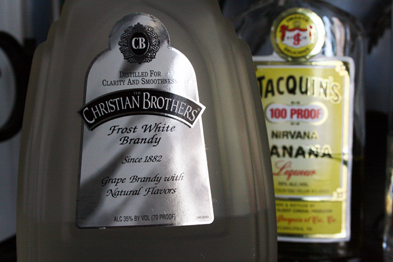 Ultimately, those odd flavors together made this brandy unsippable for me, but I’ve since had it in cocktails, and it fares much better when combined with other spirits and juices. I’d recommend it for berry-based elixirs, but if you want to pass it by entirely, I won’t tell. None in review form. Mainly, it seems to appear as part of cocktail recipes, especially the China Rose (ed. 17.12.10 Oops, I meant China Girl—recipe here), which I’ve never heard of before. I take it you like the frost white brandy? That’s great if so–everyone has different tastes. What do enjoy about it? Becca, this is the Brandy in my Avila Angelica. It is still the cleanest neutral spirit out there. Interesting! I definitely prefer it for that usage than straight up like this. That’s so funny how much my opinion changed based on the usage, because I loved your Avila Angelica!